Homer Yasui sent me this image last year. 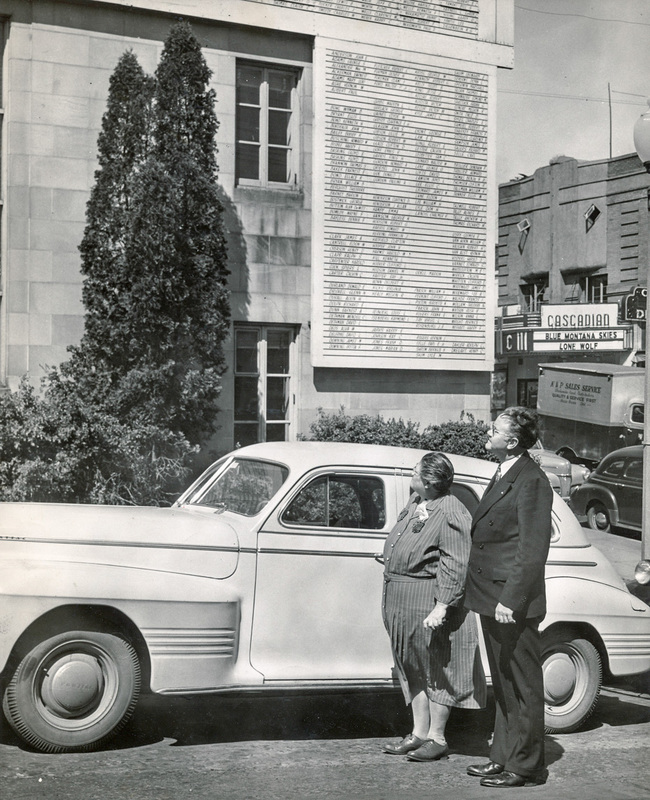 It shows Arline Moore and Sherman Burgoyne viewing the "Honor Role" at the County Courthouse (Butler Bank Building) shortly after World War II. Moore and Burgoyne led the effort to restore the names of American soldiers of Japanese ancestry to the roles. They had been removed by the American Legion in 1944 as part of a move to discourage Japanese Americans from returning to Hood River. Arline Moore owned Moore Electric. Sherman Burgoyne was a Methodist minister. As a result of his advocacy he was transferred to a church in tiny Shedd Oregon. Eventually his contributions were nationally recognized. "Blue Montana Skies" (on marquee in background) was a 1939 Hollywood release, but it probably was in the theater after the war since Hollywood production was severely limited during he war. Yes, that is definitely "Grandma Moore." She was a great advocate and a tremendous help with the minorities of the time. She continued on and was very involved with the Wyam's at Celilo. A very remarkable, intelligent pioneer woman in Hood River. Admirable endeavor by these individuals. Having grown up in the Asbury Methodist church, I would be very interested in who all was involved in getting Burgoyne "deported". HR should be proud of the end results......but real, real sad that the names needed to be restored. Both of these Hood River people are heroes amongst a community who would not accept it's former citizens who went to war and were considered brave in their war service. Burgoyne later received a national award along with Eleanor Roosevelt and Frank Sinatra. The local Chamber of Commerce published a series of letters attacking him. When he was transferred to Shedd, Oregon at the request of his congregation no one would buy his 10 acre farm. It is a period of shame for which I hold great sadness. Many Japanese who did not return went on to become outstanding if not famous in their fields of work. A point of loss and shame for this community. My brother has a very large picture that was taken during a war bond drive that shows a large crowd and the original listing of names. I have often thought it would make a good picture to feature here but it is too big. I was told that one of the names blacked out on the list was actually someone of Finnish descent. Whoever was blacking out names didn't know the difference. Does anyone know what happened to the signs? I tell you what, Arline Moore, was one gutsy lady for her time. This is the first I have heard of Sherman Burgoyne. Norma's comment about blacking out a Finnish name is interesting, as is the connection with the Japanese and Finnish language. Do you know in which country your Nokia phone was developed? For some reason, the Washington side of the river seemed to be more compassionate toward the Japanese/American citizens. You wouldn't think there would be that much difference. I think the Dickey family and others took care of the Japanese farms when the owners were sent to the camps, returning them back to the owner. Evidently Mr. McIsaac of the Parkdale store was not afraid of local opinion and continued to support the local Japanese/American residents. Forty years ago, a friend of mine took his friend of Japanese descent to an Elks event in HR, and the Japanese/American who had fought for the U.S. military was turned away. But, in all fairness I didn't live during these times of strong feelings. We had been attacked. I guess it would be a good idea to understand the difference between a resident and a citizen and the legalities of being a U.S. citizen. This raises two questions in my mind: would I have recognized the injustice, and would I have stood against it like these two brave HR residents? I know what I would like to believe, but we can't know the true answer. As I have stated here in another photo, my mother was not against the internment. She said a young Japanese man had told her they were going to war with us and they were going to beat us. I suspect those who felt that way, were not citizens and had probably already left the country. Linda Tamura discusses those 16 names in her book, "Nisei Soldiers Break Their Silence: Coming Home to Hood River." From the book: "The Shifting Grounds of Race:"
"....For the American state, the Nisei soldier served as a model of self-sacrifice on behalf of national interests. Frank T. Hachiya----a Nisei from Hood River, Oregon----drew nationwide plaudits, including a February 17, 1945, editorial by the New York Times. A graduate of the Military Intelligence Service Language School (MIS), Hachiya served in the Pacific theater, where he volunteered to scout troops behind enemy lines but was struck by gunfire on his return. With his last living breaths, he delivered maps of the Japanese defenses to an American officer. Retelling these heroic feats, the Times chastised the Hood River American Legion post for removing the names of Hachiya and fifteen other Nisei from a monument dedicated to veterans from the area. "To be sure, his eyes slanted, his skin was yellow, his name different," declared the editorial. "But Hachiya was an American." I agree Arthur. Sadly, I don't think I would have been as gutsy as Arline Moore. Do we know if Arline and Sherman are looking at the blackened names or the restored names? I learned something interesting at one of my family reunions this year. Some of my family are descended from Volga Germans, which means they were Germans who had been living in the Volga region of Russia since the late 1700's. In the late 1800's they immigrated to the U.S.
During the Depression, many of them moved to the Vancouver, WA area where there was employment. I learned that when Hitler came into power, my great grandparents were quite vocal about supporting him. They wanted to see Germany strong again. Which was odd because they had never lived in Germany. Their sons, my great uncles, had to tell them to hush up or they would get into trouble. My Father, and two Uncles names were among those removed from the roll....My Father returned to Hood River following WWII and found his farm in disarray due to the neglect from the man who leased it from him, and NO JAP signs in store windows. sad, sad, sad. My Father never talked about the incident with me and it was just recently that I found out that he was among those soldiers.